Cash, checks and credit cards are accepted. We ask that you register prior to the class date. Fee- The class fee is $38.00 and is due the day of class. If you are interested in renting supplies, please contact me for details. Painting Supplies Rental- The fee for renting painting supplies is $25.00. If you are interested, please contact me for details. You can have a special experience with your family, friends or group. Checks, credit card and cash are accepted for private classes. 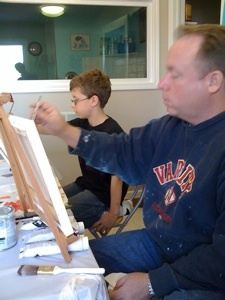 Open session- You can schedule sessions for you and your friends --2 or more painters that will also be open to the public. Fee- $38.00 per person. • If something comes up and you have to cancel, please let me as soon as you can. • Classes are scheduled depending on student registrations, so low enrollment may result in a class cancellation.